UPSC Registration 2018: Check UPSC Registration Online Process for NDA/CDS/LDCE here!!! Contenders, keen to apply for UPSC Notification can follow given UPSC One Time Registration Part1-2 Procedure while already registered candidates can go for UPSC Login with the help of guidelines given on this page. Union Public service commission has fixed the procedure of UPSC Registration 2018 in two phases which is part -1 and part- 2. After completion of Part-1 registration, you will get UPSC Online Registration ID on your email and then you can check the status of your registration form for part-2. Without completion of phas-2 registration, your process will not be completed. UPSC NDA 2 Notification will be issued on 06-06-2018 and contenders will be able to submit NDA II Application Form till 02-07-2018. By following the below mentioned procedure, You may easily complete UPSC Registration 2018 process. How To Apply For The UPSC Online Registration 2018? To complete the UPSC Registration Part 1 and UPSC Online Registration Part 2, you have to follow the below steps mention on this page, please have a look…!! Now you have to hit link as “Online Application for Various Examinations of UPSC” from opened page. Select the Examination to apply for and hit on UPSC Part 1 Registration 2018 as shown in below mentioned image. Then you are required to follow “Press Here for PART I भाग- I के लिए यहां क्लिक करें” link. 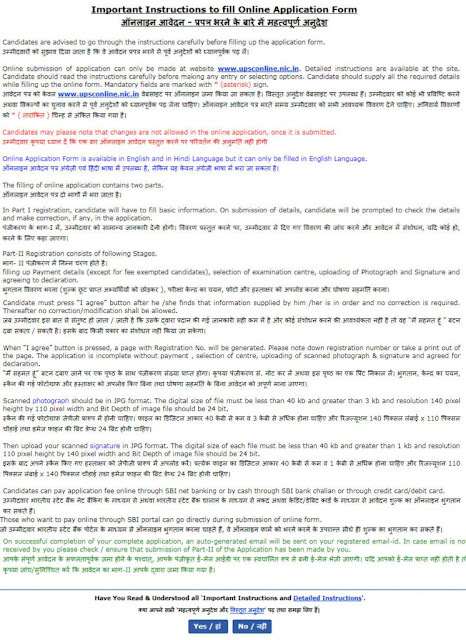 Read complete information for UPSC Registration Part 1 as shown in below provided image. After reading the entire details, you may press “Yes / हां or No / नहीं” button. Now UPSC Online Registration Part 1 begins as depicted below. Now you have to fill the application form by entering the required details like name, father’s name, mother’s name and other personal details. And then recheck your form and hit the “Save & continue” button which is mention in the bottom of the page. After completion of UPSC Online Registration Part 1 2018 you will get the registration ID on your registered email Id. Note down your Registration ID and Keep it on safe place for part- 2 registrations. Follow UPSC Registration Part 2 and then select “Click Here for Part II भाग- II के लिए यहां क्लिक करें” link. 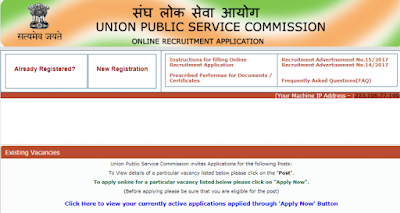 Now you will see details for UPSC Registration Online as shown below. And after that you have to hit the “submit” button. On the next page you have to enter the required details related to the center you want to choose and upload the necessary documents like Photograph and Signature file. After that do your fee payment. You can pay your fee online and as well as offline. And the hit the “Submit” button. Now you’re Part-2 Registration form has been successfully completed. You must note down the registration ID and password for future use. Hit on “Online Recruitment Application (ORA) for various recruitment posts” link. A new page will opened as shown in image. New applicants may hit on “New Registration” link. 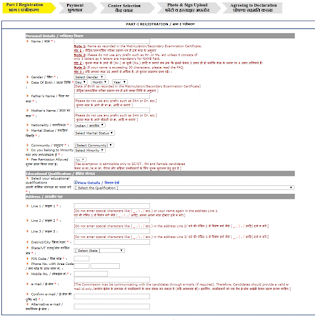 Fill UPSC One Time Registration form with required information as shown below. After filling entire details, you may hit on “Save & Continue or Reset” button as per your choice. Open below provided link to fill UPSC Online Registration Form directly. Registered person then you may hit on “Already Registered” link. A new page will open as shown below. Fill ask details like Registration Id, Password and Confirm Random Image in blank text box. Hit on “Submit / Reset” button and complete the UPSC Online Application Form before the end date. 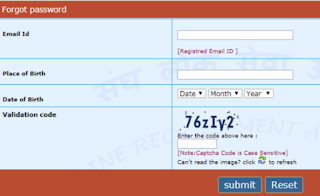 What To Do If You Forgot UPSC Registration Id / Password? At the time of UPSC Registration, if contenders forget their Roll Number / Password then they can recover it by following given guidelines in appropriate manner. Go through ORA for various recruitment posts link. Now select, Registration link from opened page. Hit on “Forgot Registration ID & Forgot Password” button. 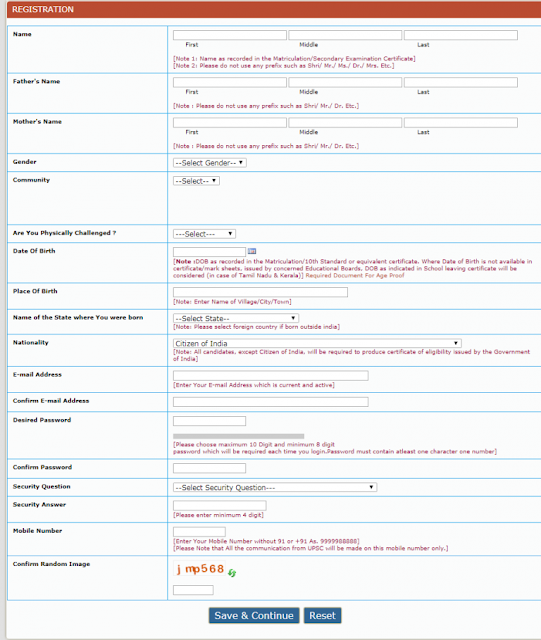 Then fill asked details such as Email Id, Date of Birth and Validation code as shown in below stated image. 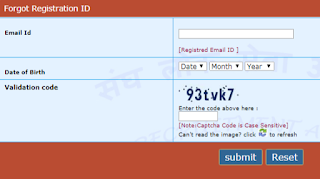 Hit on “Submit” button and your UPSC Forgot Registration Id should be recovered successfully. Those aspirants who forgot their union public service commission Registration ID they can recover it by following some necessary steps. They must have conductive Email ID and they have to enter their Email ID and will receive the one time password to generate New registration ID. After that they need to hit the link which they have received on their email ID. After hitting the above said link, New page will be open on your computer screen. Now they can recover UPSC Forgot Registration Id and login their account by entering ID and UPSC Registration Password. Now they can check UPSC Registration Status. Do You Know About Required Documents While UPSC Exam Registration 2018? Digital Photograph & Signature: aspirants have to upload a color photograph and signature in JPEG format to do UPSC Part 1 Registration 2018. UPSC has a precise rule on the size and dimension of the photo and signature acceptable application form. While scanning the photo, you have to edit the image in Photoshop or a similar tool to achieve the required dimensions. ID Proof: As per the Union public service commission, applicants may use their aadhar, an account number of any nationalized bank, driving license, voters ID, PAN card and passport for one-time registration. Candidates need to visit the Official link to get the further details about the UPSC Registration 2018. For more information about the UPSC NDA Part 1 Registration and UPSC NDA Registration Part 2 you can bookmark this page by tapping ctrl+D.